This was a new low for the #FakeNews media. Newsweek completely made up a story to smear beautiful and gracious First Lady Melania Trump. 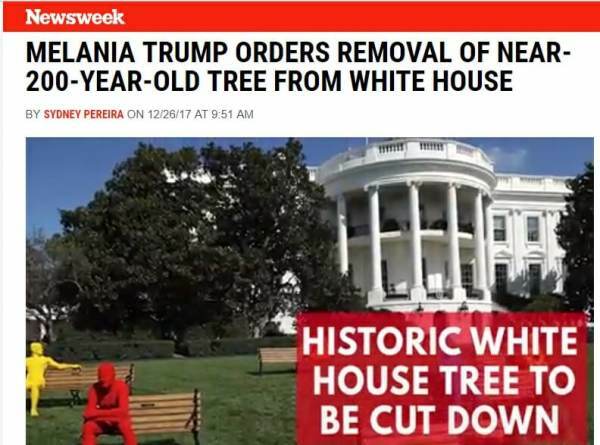 Newsweek claimed heartless Melania told the White House grounds crew to cut down a 200 year old tree. The tree was falling over and had to be removed — so they used the story to smear the First Lady. But CNN and Newsweek blamed Melania Trump for the tree removal. Did the liberal mainstream media EVER make up a negative story about Michelle Obama?